April 27, 2017 - As climate change impacts unfold and its effects intensify, investing in adaptation strategies that increase the resilience of agricultural production to climate change is crucial for millions of farmers. However, there are many social and economic barriers that prevent small-scale farmers in developing countries from making the necessary adaptation investments that will help them survive in a changing climate. 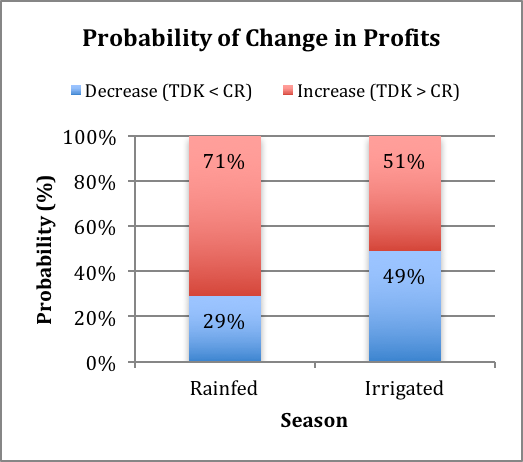 Assessing the profitability of investing in adaptation strategies is an important method to identify potential barriers and is a critical consideration when trying to encourage farmers to invest. Increasing profit and lowering risk is a primary consideration for any investor, but is especially important for vulnerable populations already struggling to survive on two dollars a day to feed their families and send their children to school. In order to account for the fluctuation of yields and market prices over time in calculating profits, historical price and yield data from the previous decade was used to determine a more accurate baseline of CR profits. 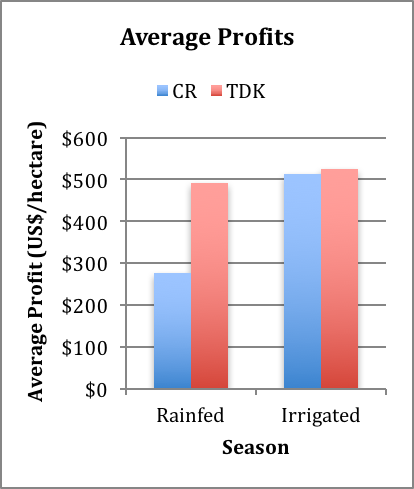 Yield data for TDK was based on three years of field demonstrations. These baseline parameters were used to extrapolate results in order to more accurately determ ine profits and their probability of occurring. In doing so, we provide a range of profits with their respective probabilities, rather than just the average profit. Judson Peck, M.S. in Environmental Policy, is a consultant for UNDP’s Climate Change Adaptation Program. He interned with UNDP in Bangkok, Thailand and traveled to Lao PDR to conduct this research for his master’s thesis at Bard College’s Center for Environmental Policy in New York.